The Rigo System Cheneau (RSC) brace is a thermoplastic scoliosis brace modeled on a hyper-corrected positive plaster cast of the patient. This is a three-dimensional correctional brace that has significant pressure and expansion areas built into it, providing correction in all three anatomical planes. 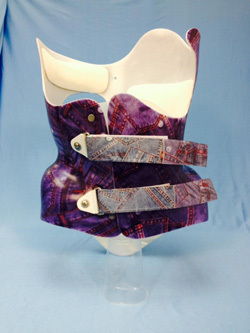 The brace is not merely a brace, but an all-embracing therapy to treat idiopathic scoliosis. The biomechanical design of the brace implements physiotherapeutic exercises and uses curvature-specific modules based on the Schroth Method. The Schroth Method for scoliosis is a conservative exercise in a three-dimensional approach to elongate the trunk and correct imbalances of the spine. The goal is to develop the inner muscles of the rib cage in order to change the shape of the upper trunk and to correct any spinal abnormalities. The patient utilizes specific exercises to straighten, centralize and de-rotate the spine with corrective breathing techniques. Exercises are designed based on the curve patterns and severity, as well as the patients function and mobility. The goal is create awareness of the new posture and alignment through position, repetitions and breathing. Exercises are designed to reduce the flat back and rib prominence and restore alignment of the pelvis. Exercise positions may be modified in order to create the optimal position for the patient. The Schroth therapist guides the patient with tactile stimulus so the patient has an understanding of where they need to breathe and elongate to create muscle activation to correct the curve. The RSC brace takes 15 different curvature patterns into consideration, which de-rotates the body much better through the longitudinal axis, rather than other braces. Each brace is individually manufactured and made without plaster. A 3-D scan is captured with an Omega Tracer system in order to produce a three-dimensional model of the patient. The computer image is then modified with corrective forces and used to fabricate the custom scoliosis orthosis. A tape measure and pictures are also used to obtain measurements. The main benefit of the RSC brace is the unique and highly effective biomechanical design tailored specifically to the patient. Successful treatment with the brace is based on targeted and consistent implementation. Conclusion: These primary findings suggest that out-patient physical therapy utilizing the Schroth method may be a successful alternative to the traditional methods of treating scoliosis. Conclusion: Good compliance of the RSC brace and a specific exercise regime resulted in a significant improvement in curvatures, poor compliance resulted in progression/deterioration. A poorer QoL in the non-compliant group possibly was caused by personality traits of the group, being more emotionally immature and unstable. Scoliosis. 2013; 8(Suppl 1): O44. Conclusion: Although the number of patients who reached skeletal maturity was relatively small, 73% of their curve could be stabilized by the treatment. Rigo-Chêneau brace was effective for the treatment of adolescent idiopathic scoliosis. J Child Orthop. 2012 Aug; 6(4): 327–331. Conclusion: The treatment of mild to moderate AIS with the RSC brace provides excellent clinical results. Its added benefit is enabling a three-dimensional correction of a three-dimensional deformity. Pre-treatment high Risser score, low Cobb angles, and low ATRs are associated with treatment success. The system of exercises for scoliosis was developed in Germany in 1927 by the late Katherina Schroth, who was researching treatments for her own scoliosis condition. She suffered from moderate scoliosis while growing up and underwent treatment with a steel brace at the age of 16 before she decided to develop a different treatment for herself. She worked to correct her deformities by inflating the concavities of her body selectively in front of a mirror. She attempted to mirror the deformities by overcorrecting with the help of certain pattern-specific corrective movements. The treatment included specific postural correction, correction of breathing patterns, and the correction of postural perception. By the 1960s, the Schroth Method had become the standard non-surgical treatment for scoliosis and was further developed by Katherina’s daughter, Christa Lehnert-Schroth. The first studies were carried out from 1989-1991, with the first prospective study published in 1995 in German. The Schroth family has authored a number of books and articles to educate others about their method. Dr. Manuel Rigo was one of the most important international instructors who brought the original Schroth method program to the U.S. and the UK and investigated the outcomes of the treatment. Today, the Schroth Method is recognized as an alternative to surgery or other treatments all over the world. All employees and physicians working at health-care facilities licensed by the Department of Health who provide direct care to patients or consumers. All employees and physicians working at the private practice of physicians who provide direct care to patients or consumers. All employees and physicians working at an employment agency who provide direct care to patients and consumers. The name of the employee's health care facility or employment agency. The title of the employee must be as large as possible in block type and should occupy a one-half inch tall strip as close as practicable to the bottom edge of the badge. An employee shall not be required to wear an identification badge while delivering direct care to a consumer if it is not clinically feasible. The last name of the employee may be omitted or concealed when delivering direct care to a consumer who exhibits symptoms of irrationality or violence. Act 110 applies to physician offices and entities licensed as health-care facilities by the Department of Health. PPTA Annual Conference, Seven Springs, Oct. 23-25. Please feel free to submit your questions on the Rigo System Cheneau® Brace and the Schroth Method for Scoliosis as well as any other issue you would like addressed.